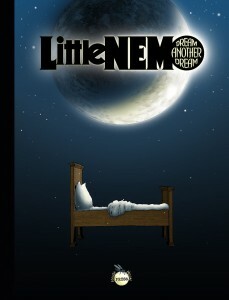 A massive collection in terms of sheer size and creator input, Little Nemo: Dream Another Dream brings together a veritable who’s who to pay tribute to Winsor McCay’s most enduring creation. 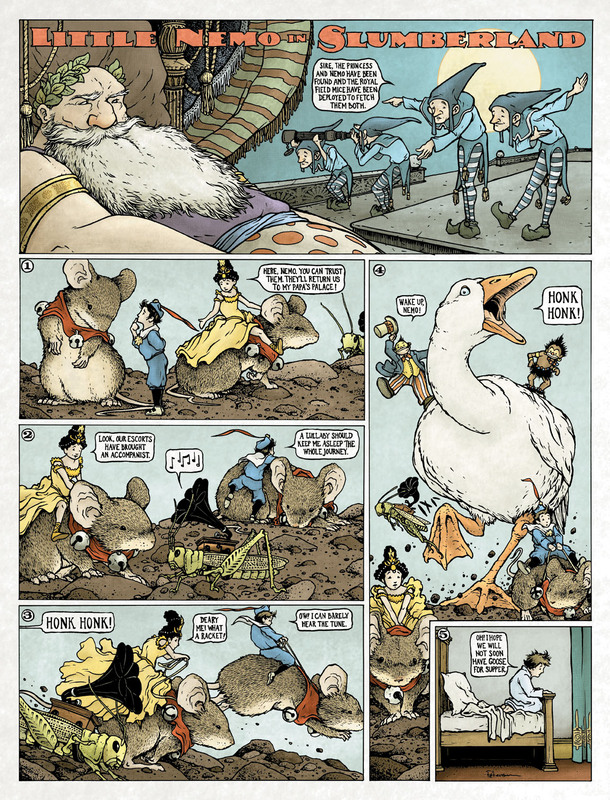 Over 100 of today’s best cartoonists pay tribute to comics’ greatest innovator, Winsor McCay, in one giant book. 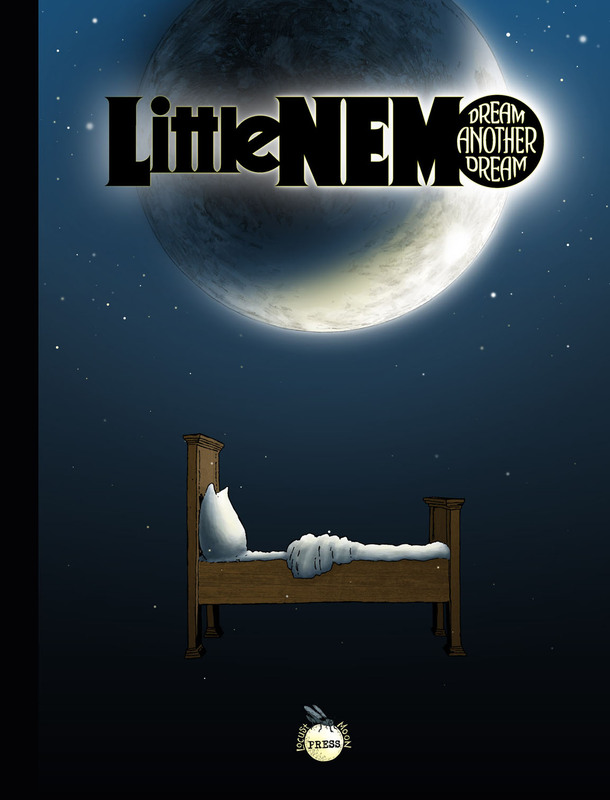 In this massive, 144-page, 16″ x 21″ hardcover, many of the world’s finest cartoonists and illustrators have created new Little Nemo in Slumberland strips, following their own voices down paths lit by McCay. Taking on the same giant, broadsheet newspaper-sized canvas as McCay, artists such as Michael Allred, Paul Pope, Yuko Shimizu, J.H. Williams III, Charles Vess, David Mack, J.G. Jones, Craig Thompson, Paolo Rivera, Carla Speed McNeil, Bill Sienkiewicz, P. Craig Russell, Ronald Wimberly, Denis Kitchen, Jill Thompson, Stephen R. Bissette, Gabriel Bá & Fábio Moon, Farel Dalrymple, John Cassaday, Peter Bagge, Cliff Chiang, and over a hundred more have all done some of the very best work of their illustrious careers. This began life as a successful Kickstarter and is now available at your local comics shop and Amazon. Basically Locust Moon Press gathered together single page comics from 118 different artists and collected them in a massive 16″x 21″ hardcover as an homage to Little Nemo In Slumberland, whose tales graced newspapers one hundred years ago at this same broadsheet size. With a credo of one-and-done from such a multitude of creators at this size it’s a sensory overload when admiring and meandering over every page. Because the talent pool is so varied each approach is fairly unique, which is saying something when 118 different strips are presented with the same basic premise of Little Nemo having a dream adventure that completes itself all on mostly one page. I say mostly because some strips go a little longer to two pages and David Mack has four. It’s a complete anything goes, since the premise of visiting your dreams really leaves it wide open. Whimsy and flights of fantasy reign throughout. Those creators who let it all go gave the most unique and memorable strips, but even those who kept it in their own wheelhouse and worked their own material are colourful and vibrant. There is a nice Canadian contingent involved: Ramón Pérez, Dean Motter, Paul Rivoche, Gerhard, and Marco Rudy to name a few. Reading those brought out the different approaches to what was presented. Some creators chose to work their own creations into the Nemo mythos, like Mister X and Somnopolis by Motter, which makes sense to promote your own work and give the reader a clue who you are just by reading the strip. Which brings the two-edged sword of the book’s organization: the strips don’t seem to be in any order, which is great from a reading experience. But not all the creators legibly signed their strips, so there’s some flipping back and forth between the table of contents and the page you’re on that may or may not have a page number. Perhaps it was the publishers intention to have the reader take in and enjoy each strip without knowing who created it. There are many names I recognize but also many I don’t, and in no way is the reading enjoyment diminished by taking the strip at face value and not giving it credence based on the name. The samples here are not credited for that reason. Because size is as much a factor as everything else, production becomes paramount. A very sturdy hardcover with sewn binding, this book lays open at every strip and is easily read. Because it can lay open so easily the stitching is closer to the fold and as such is quite visible. Several of my pages have large stitch holes in the paper at the bottom of the book and makes me wonder how well it will hold up to multiple reads. And multiple reads is a given with this much varied material. Besides the contents page we’re treated to a single page introduction and the book closes with a biography of McCay. 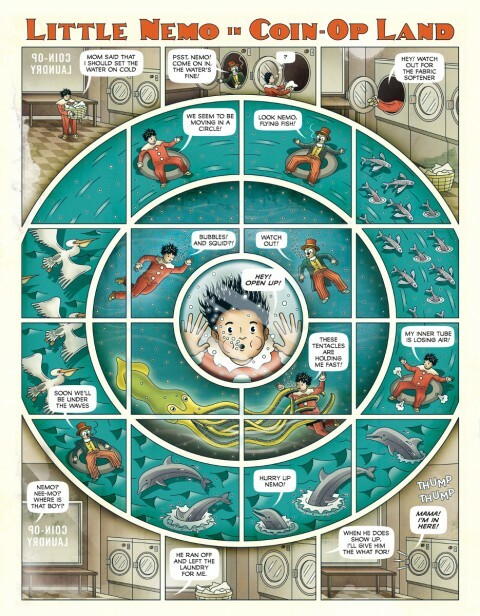 The endpapers and closing strip are Little Nemo by McCay. The endpapers are particularly nice: a collection of final panels where Nemo wakes up. It felt like a classy way to finish up. The complete creator list is also offered alphabetically on the back cover. 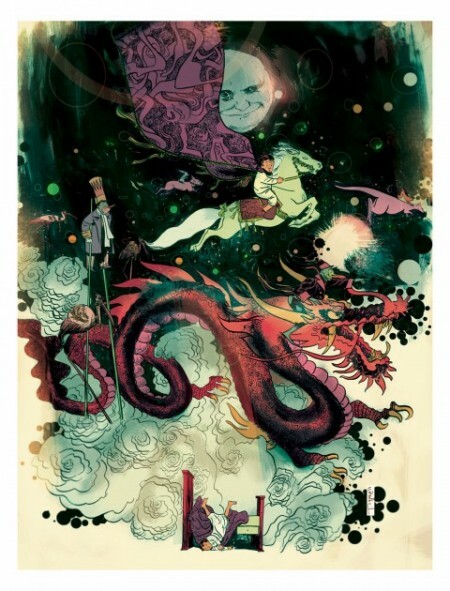 The price is listed as “suggested” because Locust Moon Press has offered the book through Diamond for a net price, meaning no set cover price and discount is applied like most books; this is the same way IDW offers their Artist’s Editions. Locust Moon is selling the book through Amazon as a 3rd party reseller and on their own site for the price of $124.99 USD so that’s what is listed here. It’s a big purchase and may work best this season as a gift.